St Johnstone made progress in the Scottish Cup with a comfortable win against Raith Rovers in the rearranged fourth round tie at McDiarmid Park. The visitors were caught out on 31 minutes when Andy Jackson ran on to a long ball and blazed in a good strike. Soon after the interval, Steven Milne smacked in a smart half-volley from a Kevin Rutkiewicz headed knockdown. Paul Sheerin added a penalty on 57 minutes, while Graham Weir grabbed a close range finish for Rovers. St Johnstone will now visit either Cove Rangers or Ross County in the next round of the tournament. The Second Division outsiders made a bright start and Saints defender Goran Stanic made a great double goal-line clearance to deny striker Steven Hislop. However, once the home side established a lead, there only ever looked like one winner. And Saints squandered several good opportunities to add to their tally, with Kevin Moon often guilty of making the wrong choices in front of goal. "All credit to Raith, they made it a good cup tie," said St Johnstone boss Derek McInnes. 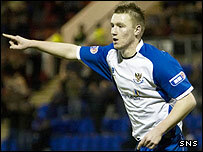 St Johnstone: Main, Irvine, Stanic, Moon, Rutkiewicz, McCaffrey, MacDonald, Craig, Jackson, Milne, Sheerin. Subs: McManus, Anderson, Weatherston, Daal, Cuthbert. Raith Rovers: Renton, Wilson, Dingwall, Tod, Andrews, Winter, Sloan, Davidson, Weir, Hislop, David Templeton. Subs: Borris, Carcary, Helley, Wedderburn, Fahey.